On Saturday at 3:52 p.m., we wrapped up our week-long Race to 3:52 – our time to unleash the creative and collaborative powers of our staff. 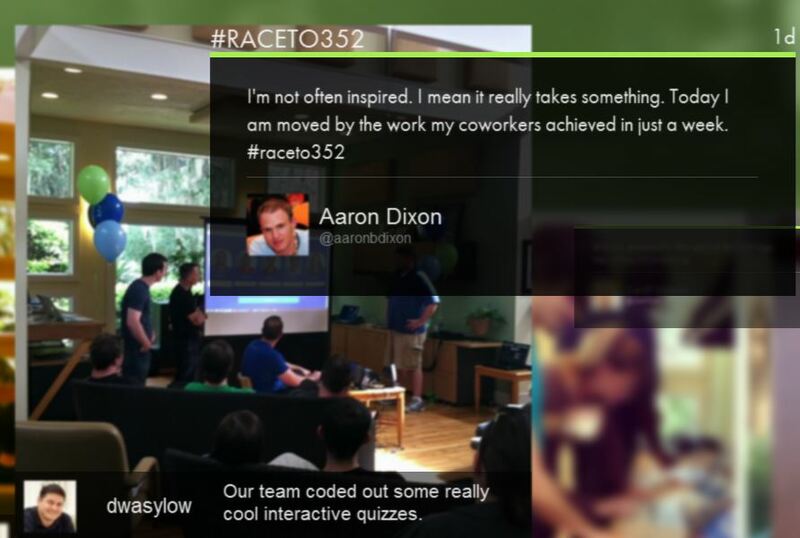 The Race was a way to let our talented designers, developers, marketers and support staff unleash their skills to develop new products and activate the new 352 brand. The results are nothing less than remarkable – 60 employees completing and launching 15 projects in just a week’s time. Of course, it wasn’t just work, work, work all week long. We took some time off to chase balloons around (like the professionals we are), have some barbeque and bring our three offices together for a week. As a company, this was an exciting time to get back in touch with each other and to see what we could accomplish with no limitations. So, what did we accomplish? Take a look for yourself, at the first half of the Race to 3:52. We’re huge fans of the Pomodoro Technique for time management. Since our development time-tables have shrunk from months to weeks, it’s even more important for our teams to accomplish tasks in a set amount of time. However, some of our development teams began bumping into the constraints of Pomodoro: namely, that it locked you into a 25-minute period of productivity where we would find it to be in the zone for closer to an hour, as well as the limitations on sharing your work timer. The Marinara Timer was built to make the Pomodoro Technique a bit more fluid and shareable. You can set a regular Pomodoro, or you can create a custom Marinara timer that can be shared with a team via a unique URL. Start keeping yourself in check at MarinaraTimer.com. Once you get timeboxing, you can tinker with some custom sound effects: we recommend Ed’s Laugh. 352’s marketing teams read numerous online articles and blog posts every day to stay informed of the latest marketing news and trends. That often means visiting over a dozen websites a day in order to review content from all the most valued sources. Imagine how much easier it would be if all that content were displayed in one place. What if there was an iPhone app that compiled the industry’s most important and compelling stories, videos and podcasts? That was the inspiration for The Lead. 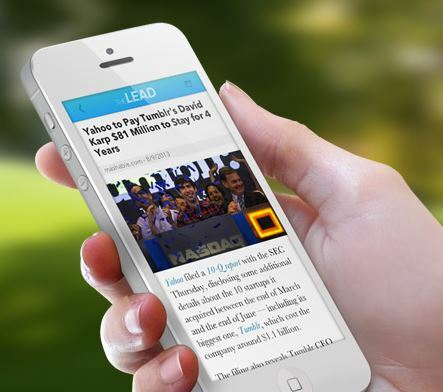 The Lead is an iPhone app created by 352 to gather daily content from the web’s most influential marketing sources. It’s a perfect one-stop source for CMOs, Marketing Directors and industry insiders to review the day’s most important marketing stories. The Lead will soon be available on the iTunes App Store as well as online at TheLeadMarketingNews.com. We like to see what people are saying about us, but checking Instagram and Twitter constantly gets tiring. And it digs into our workflow a bit (well, it did before Marinara). So we decided it would be best if we just had one big place to see all the social content we shared and what people were saying about us. Behold, the 352 Wall, an interactive stream of Instagram and Twitter content that can be set to pull from specific hashtags or social streams. The background image is selected at random from our stream, and the wall does the rest of the work, choosing images and tweets from the company stream. If you were following the #raceto352 hashtag last week, you’ll be familiar with some of the content currently on the wall, but we’re excited to show what this technology is capable of. We’ll be showing off the interactive wall at conferences and in our office lobbies coming soon. If you’re anything like us, you grew up reading Choose Your Own Adventure books. We took that passion and made an entertaining, and educational, game that leads you through the differences between traditional web development and the agile web development methodology that we have adopted here at 352. 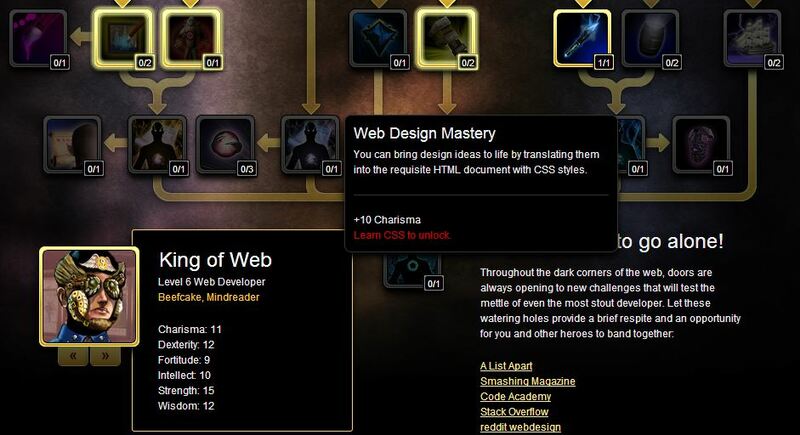 The game will lead you through each step of the web design process, from sales to launch. You’ll either wind up with a functional website, or you accidentally initiated the zombie apocalypse – and, no, you can’t keep your finger on the last page, you cheater. Choose Your Own Adventure…just watch out for stray tornados. Apart from the great content work done by our team, I love the art done by interactive designer, Tim Pratt. Each game screen was crafted one pixel at a time, which just goes to show how much effort each of our teams put in to making each project an incredible success. Choose your destiny at DevelopmentDestiny.com. Data is a beautiful thing, my friends. We all know that data means everything to businesses. Too often, many business owners are unsure of how to find the Analytics data they need, or don’t know what they should be looking for. Our marketing department paired with a designer and a developer to build a plug-in for our custom admin section to provide site owners with the information they need to succeed, including rolling averages of Goals and Unique Visitors, device trends across desktop, mobile and traffic, most shared content, and even who has been sharing your content via social media. 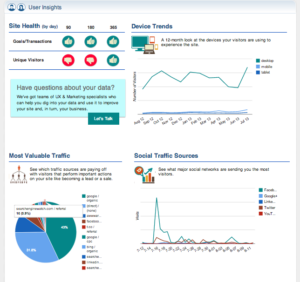 The plugin takes the information site owners need and puts it directly at their fingertips. Useless trivia saves the day. Again. Any amateur HTML coder knows the pain of messing with a color HEX code, only to discover you accidentally changed that navigation bar from a nice shade of blue to an unattractive brown. Even experienced designers have trouble decoding the six-character codes that are behind every color on the Internet. That’s why we created HEX Invaders, an easy game where you fight off an alien invasion by correctly interpreting HEX codes. Believe me, it’s not as difficult as it sounds (and I’m a little bit color-blind). 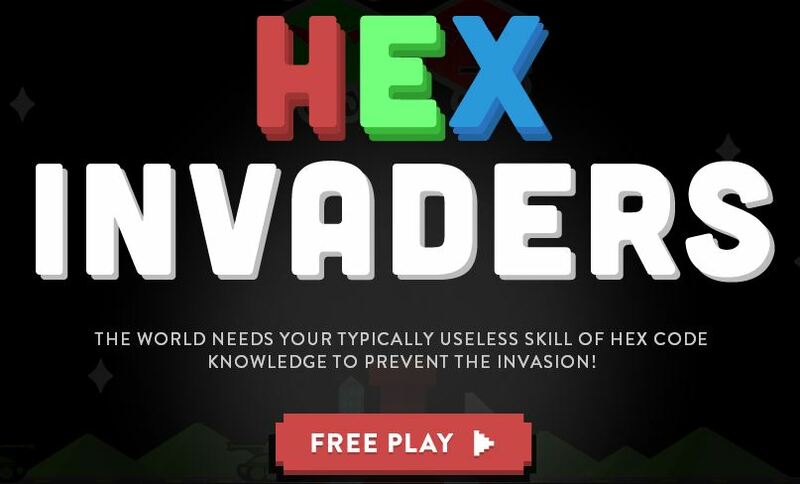 Like many of the games we created, HEX Invaders is mainly an educational tool for burgeoning designers and developers. The game begins with a simple tutorial that explains how the codes designate a particular color, and then you get to saving the world, one color at a time. I can tell you’re impressed, because I’m a Lvl 6 Mindreader. If Sporcle.com is any indication, people love quizzes, and we’re no different. We built a series of quizzes that help our clients get to know our teams, but that’s only the beginning of what this technology can offer. In the future, we’ll use our quiz platform to help visitors learn things like new development technologies, SEO best practices and more. For now, you’ll just have to guess which Team Blue member once owned the complete line-up of Teenage Mutant Ninja Turtles action figures. Take a crack at some 35Q quizzes now. Check back tomorrow for Part 2, in which we’ll focus on the new websites and and video projects we’ll be building upon for the next few months.